After the night of fun and frolics at the Riverside Pub in Lisdoonvarna, we woke up to a cloudy day. Peg is leaving for Spokane on Monday and we really wanted her to meet our good friends Tommy, Maura and Martina Neilan. Peg had heard the stories over the years about the Neilan’s and how important to us they’d become, they are our last stay here at the end of this years adventures, but we wanted Peg to meet them. Also the last trip Martina let me keep my big guitar flight case at their place so we didn’t have to drag it all over Ireland. I’d emailed Martina to ask if that would be OK this time and to tell her we’d like to come by for a visit and she responded saying she’d be happy to see us and it’d be fine to drop the case off. Down to Gort we drove, taking some of the smaller roads across the Burren. One of the delightful things about Ireland is how close things are. When you’re in West Clare and think about visiting friends in East Galway the tendency is to think it will be quite a drive and hours away, but it isn’t. To get to the Neilan’s from Fanore is just about an hour of driving on small roads, passing through beautiful country. We made a stop in Kilfenora to visit an old ruined Abbey that had been partially restored. It had some lovely stone crosses that were preserved within it and on the grounds. Just as we arrived at the Neilan’s, pulling into the lane that leads to their farm, we saw their car coming towards us. We hailed them and there was Maura and Tommy. We were all glad to see one another and Tommy told us to go to the farm, that Martina was there and they’d be back in a half hour. We got back in the car and drove into the farm. James called for Martina but didn’t raise her, as he went around to the front of the house he told me he was sure she was in there and for me to give it a try. I stepped in towards the kitchen and yelled for Martina, she answered asking “who is it?” I responded “Rick” and she came out and gave me a hug, really pleased that we’d come by. We introduced Peg to her and greetings were made all around and before we knew it we were seated at the table and Martina was bustling in the parlor and kitchen, and against our protests, laying out a high tea for us. Tea, scones and jam, toasted sandwiches, digestive biscuits, and lots of conversation. I sensed that Martina was happy for the company. Tommy’s 85 and it’s only been in the last few years that he and Maura have started having health issues. Martina used to work in a school nearby, I don’t remember if it was teaching or administrative work but she’s had to give that up to take over the responsibility of running the farm. Tommy can’t keep up with it and Maura’s slowed down as well. Martina and her brother who has his own small farm east across the fields from theirs, now maintain the family farm. Martina’s added a nice large shed for the tractor with a workshop and storage for firewood. She’s cleaned and tidied the farm up, cut down some old dying trees, cleared brush and her brother strung. new fence all down the lane. It looks really good for all their efforts. Martina told us that they were down to 20 cows and not that many sheep. It had been a hard Winter with 3 months of rain until it turned to snow. It sounded like there was a good 2′ of snow on the ground and drifts far deeper. They lost a lamb and one adult sheep that they didn’t find until the snow melted. Besides that they all had a nasty virus, so they were grateful for the recent turn of weather. Soon Tommy and Maura were back and we were busy catching up. Tommy is always great craic, he’s a charming man and a great one for the jokes. My wife Ally fell in love with him when we were over in October 2016. We are so grateful for their affection and friendship that seeing them is always a high point of our trips. Tommy was spinning tales and jokes, showing us pictures of his mother and father when they were young, he in his Garda uniform when he lived in Dublin for 5 years, he said he left Dublin and the Garda because “they couldn’t understand my accent and I couldn’t understand theirs.” There’s another photo of his old Irish draft horse with him behind the plow and many others. Maura always has a look of bemusement when Tommy spins his stories, they’ve shared so much over the years and she seems content to listen with an occasional comment here and there, sometimes a wry aside taking the mickey out of Tommy. We visited for nearly 2 hours and reluctantly took our leave. We told them we had a session with Christy Barry whom Tommy knows, he knows so many Clare and Galway musicians, being one himself. The only thing that made the parting tolerable was knowing we’d see them in 2 weeks. 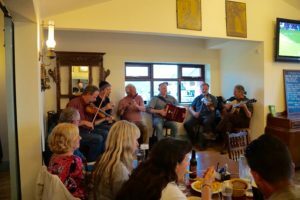 We drove hastily back and realized we’d not have time to make a meal at home and get to the session on time so we stopped at a great little restaurant in Ennistimon, then home with just enough time to grab our instruments and head down the hill to Fanore and O’Donohue’s. We arrived close to 7: 15 and Dave Lewicki was there waiting and Christy had yet to arrive. Dave said he saw a box case inside so figured Cullen Nea was there already. This being Ireland time is a bit loose, so we actually didn’t need to worry about being exactly on time but old habits die slowly. Christy shows up about 20 min. later and we have a few words and jokes, he’s a very charming fellow and we follow him in, pints in hand. He’s got a great head of curly grey hair and piercing blue eyes. Christy has told us that Cullen is a great box player and that he plays a nice easy style, not too fast and not too slow, so we’re looking forward to playing with him. The older original pub section of the building is jammed and we’re wondering where we’re going to fit! Christy leads us around to a newer restaurant section where there’s a small stage. Christy had said outside that there was a stage that was just a little bump up that could fit 20 people and still have room to dance, he must mean dancing in the restaurant because the six of us barely fit it. It’s certainly not feeling like a session. An important Hurling match is on so everyone is glued to the big screens, we’re certainly not the focus of attention, which we weren’t expecting. Generally the musicians are there for themselves and one another but there are environments conducive to that and some that aren’t. We’re learning that Christy has the gift of, shall I say, elaboration? It’s a skill that’s highly appreciated in Ireland. I’ve heard it said “never let the truth get in the way of a good story!” A “character” is prized in this country. “Oh Paddy who just lived over in Kilshanny, now he was a real character, he’d bring his pig with him when he’d come to visit!” Ireland allows for all sorts, which doesn’t mean you won’t be talked about and stories told at your expense. It’s best not to be too prideful. So Christy introduces us to Cullen, a big man with a large appetite for pints of Guiness. Christy tells us he can down the pints and then proceed to crank out the tunes and in this he wasn’t elaborating. We launch into the first tune and it’s run, run, run and grab hold of the moving freight train. Cullen has one tempo, presto and one volume, forte’. Christy was definitely elaborating on this part of Cullen, who is a fine player, note perfect and highly ornamented and hard to keep up with. A couple of amusing moments was when Cullen had some business on his phone, so off he goes and Christy got up saying “Rick, give em’ a song, I’ll just stand over here and listen, this is a good room and I want ta’ hear how you carry”, and after listening a moment scurries off for quite awhile as the four American lads are holding down the fort. We played a couple of sets and Cullen and Christy drift back in, this happened several times. We don’t mind. 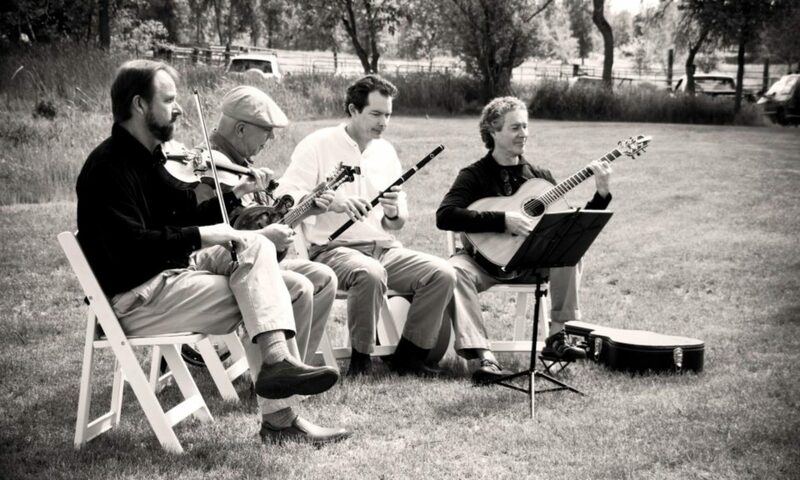 Hell, if you can get a break, lean on the visiting lads who hunger for the tunes and have the music keep going, why not? Cullen comes back after a break and says we’re going over into the Pub, there’s a spot opened up for us. This feels more familiar, a dark little room, jammed to capacity, crammed into a corner around the table, making sure my guitar head isn’t hitting the drinker next to me. We play a set and suddenly I’m really hot. I strip off down to my T-shirt and climb aboard the Christy & Cullen express. Around 10:30 we’re all tired and hot and ready to find a quieter session. We drive up the hill and drop Peg off, she’s not used to this kind of madness and is ready for some quiet space. We take our leave and head down the road to Lisdoonvarna and the Roadside to see how the session is going down there. James is looking in the window and see’s Dave who got there before us and grabbed a stool. Terry Bingham is there with Paul the fiddler and Frenchman Stephan the fluter and it’s a madhouse, the crush of people and their voices come out of the door like an explosion, not a chance of wedging our way in. So much for a quieter session. I look around the corner and Terry sees me, beckons me to come round’ but I just can’t get motivated to push through all the drunk and shouting tourists, it’s just too much for my nerves. Dave texts me to say the crowd is going back to their tourist bus in 5 min. and we should stay, but even after their departure we can’t quite handle the crowded space and go home. We agree that we love this warmer weather, but honestly we prefer to be here earlier in the season and not have to share Ireland with so many other tourists. If James’ schedule allows in the next trip we’ll return in early April like we have in the past. Everything’s so much quieter and easier to negotiate. And so ends the day. Stephan the fluter and it’s a madhouse, the crush of people and their voices come out of the door like an explosion, not a chance of wedging our way in. So much for a quieter session. I look around the corner and Terry sees me, beckons me to come round’ but I just can’t get motivated to push through all the drunk and shouting tourists, it’s just too much for my nerves. Dave texts me to say the crowd is going back to their tourist bus in 5 min. and we should stay, but even after their departure we can’t quite handle the crowded space and go home. We agree that we love this warmer weather, but honestly we prefer to be here earlier in the season and not have to share Ireland with so many other tourists. If James’ schedule allows in the next trip we’ll return in early April like we have in the past. Everything’s so much quieter and easier to negotiate. And so ends the day.